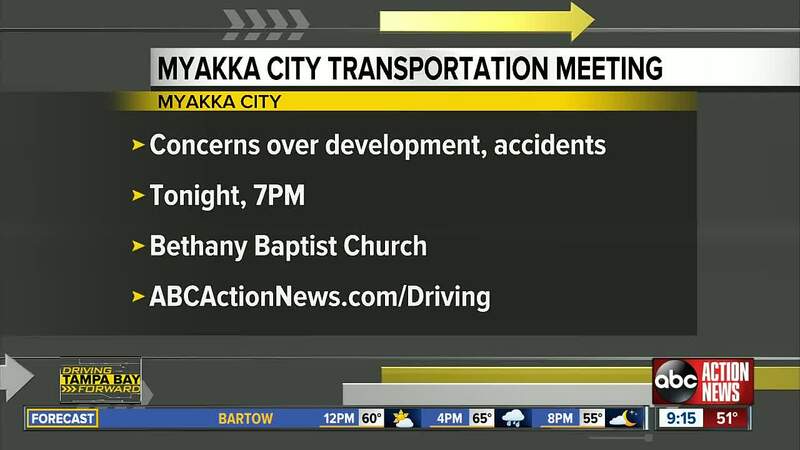 A local resident is coordinating a meeting to discuss transportation in Myakka City. MYAKKA CITY, Fla. — A local resident is coordinating a meeting to discuss transportation in Myakka City. Alyssa Gay tells ABC Action News that development in the area has been a big problem for people in the area. Gay tells us that FHP, Manatee County Sheriff's Office, Myakka Fire Dept., FDOT and many other agencies will be in attendance to speak with. The meeting is Tuesday, January 29 at 7 p.m. It will be held at Bethany Baptist Church, 26604 State Road 64 East in Myakka City. You can find out more about the event by clicking here.